Well we’re one day closer to seeing some pretty chilly temperatures around these parts and while there is still a question on IF we get into the core of the coldest air (which I doubt), there is still a chance we could see lows near 5-10° on Tuesday AM. So far we’ve had 3 mornings with lows in the single digits. Our coldest was 7° on 12/26. Just for curiosity I checked last year’s DEC 1-JAN 18 stretch of lows…and sure enough we had 3 in the time span as well including a low of 6° on 1/18/12. Before the real cold air gets here, we’re going to warm up rather nicely through Saturday. Highs today should make the middle 40s and while tomorrow should be about the same, perhaps a couple of notches cooler, we should pop into the 50s on FRI and SAT thanks to a nice downslope flow off the Rockies/Western Plains area into our region. this air will be dry and mild so we should see a nice bump up during the daytime around here. The colder air will come at us in a couple of waves. One will be on Sunday as highs struggle in the 30s, and then the stronger push of cold air comes in later Sunday night into Monday AM. Highs on Monday should get to about 20-25° or so, assuming we have enough sunshine. Should there be a deck of cloud cover though, we may stay in the teens on Monday. The question is what happens Monday night into Tuesday AM. The EURO suggests we could see lows easily in the single digits. The GFS is moving the colder air in and out so fast that we immediately see a fast return to south winds by early Tuesday AM, keeping temperatures from free falling and actually warming things up (moderating) on Tuesday afternoon. Common sense tells me that it’s tough to make these transitions from arctic air to pacific air so rapidly. These cold air masses tend to leave slower than you think. The other thing is that there can be a tendency to get some weird patches of light snow in the NW flow moving down from NE. The EURO sure enough, and today the Canadian too are suggesting at least the potential for some flurries or patches of light snow on Tuesday in the region. I don’t think it’s worth jumping on that ship yet…but these cold airmasses do some strange things, and since we seem to be on the interface of the coldest air to our NE and the warmer air to our west (or what we call the “baroclinic zone”) strange things can happen in the form of weird mid-level clouds that can mess up a forecast in no time. As the saying goes “it’s on my radar” but again lets wait a few days to see if it’s worth jumping on. The latest EURO ensembles are also moving this airmass in and out faster…meaning that TUE AM may not be as cold due to return flow, south winds, setting up faster MON night. What is somewhat frustrating to me, from a winter weather enthusiast point of view, and granted depending on how this plays out this feeling could change, is that it seems strange to me that we can’t even do an arctic outbreak like the past around here. We’re supposed to get these big expansive arctic highs build down from Canada. This next one though seems like it weakens as it moves in. The worst of the cold is to our NE, at least that’s the way it appears. Heck the GFS MOS data suggests we could be in the 40s again by TUE/WED of next week. To me that’s a stretch, but IF that works out, then I really question how the rest of the winter plays out. One thing that will be different about the arctic air coming into the US this year, compared to last year at this time is that there will be more snowcover for the air to move over, as opposed to JAN 2012 when there was little snowcover for these cold airmasses to move over (whatever ones came down they sure modified quickly last year). here is what I’m talking about. 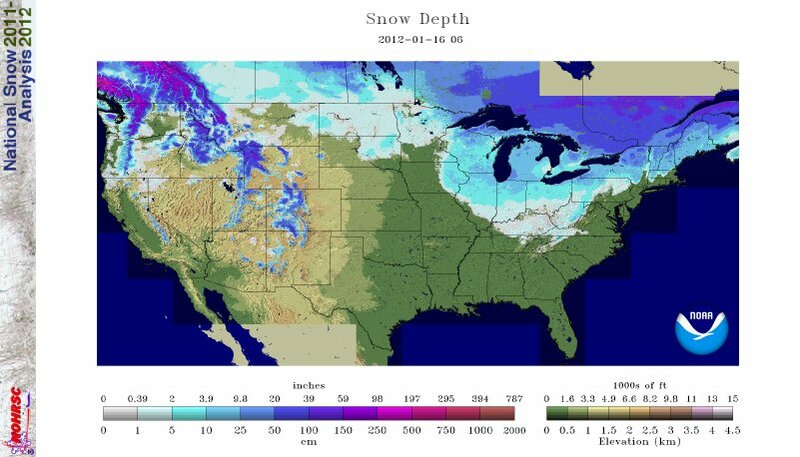 Snowcover from last year on this date is below. Now let’s look at this year, as of this AM. 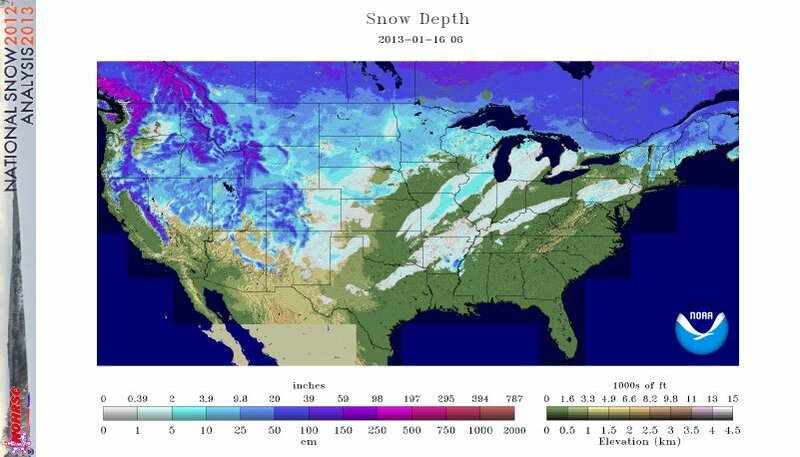 We’re at about 49% of the states covered in snow compared to about 29% last year on this date. All this cold air spilling through the Great Lakes area means the potential for some serious lake effect snows in that area so that could be interesting to watch over the next week or so. So here is your crazy weather stat of the day…so far this winter, Little Rock, AR has had 10.6″ of snowfall. Meanwhile in Chicago, they’ve had 1.3″ of snow which is 13″+ below average through mid JAN. While perhaps not as strange as last winter, it’s worth noting that so far January is running about 3° above average which is following a December of 4.4° above average, meaning unless things really change during the next 15 days, it’s going to take a pretty cold February for us to have an average winter when it comes to temperatures as opposed to an above average (again) winter.